Be prepared to target visitors like never before! 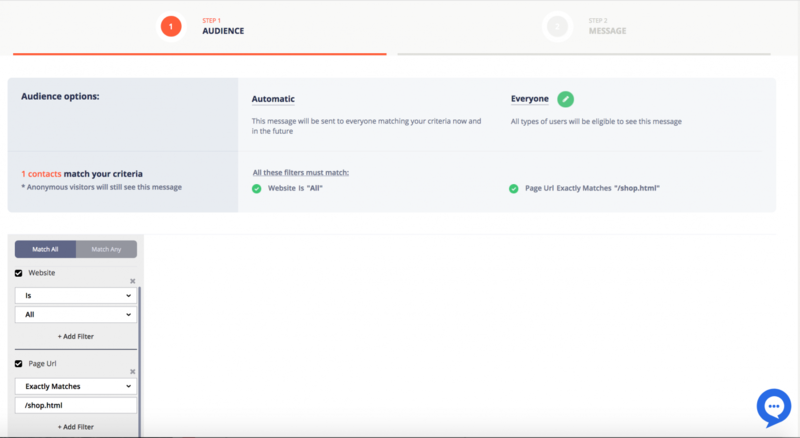 With Smart Messages, you can automatically popup custom messages via chat to target your website visitors in many different scenarios. 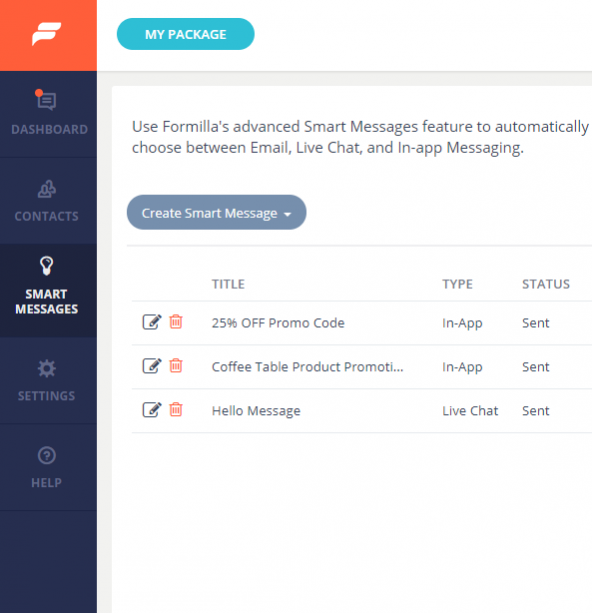 Note: the chat Smart Messages feature is available with Premium Plus accounts. First, you’ll want to ensure you are registered for a Formilla account. Once you are registered, simply login to your Formilla dashboard and click “Smart Messages” from the left menu. Name your Smart Message – website visitors won’t see the text, so you can write whatever you’d like here. 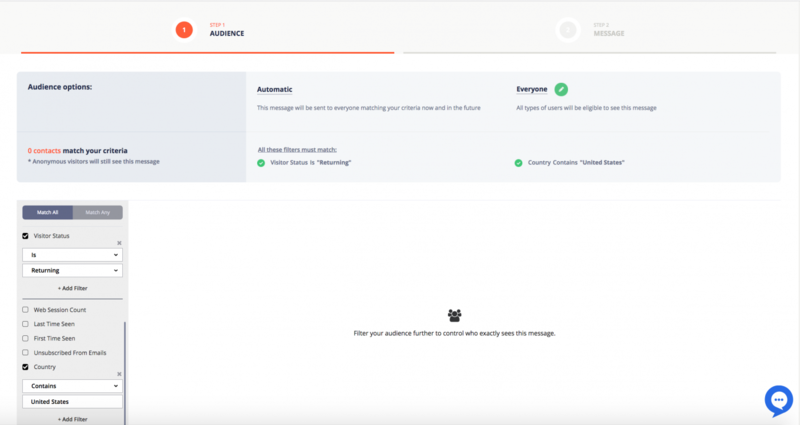 Audience Tab – where you can customize your smart message targeting. 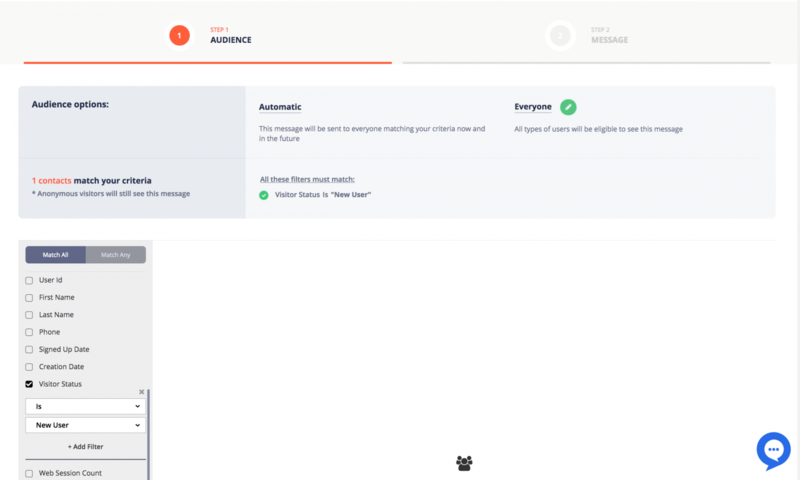 Message Tab – you will be able to set up your message and the time on page setting — 15 seconds by default — for it to popup. You’ll also be able to configure the frequency of your message to show it only once or once per visit. Note: by clicking “Save” from the top-right corner, your message will be saved as a “Draft”. This means, it will not be sent to your visitors yet. You can continue editing it at anytime, and once you are ready to send it to your visitors, simply click “Send Now” from the top-right corner. Message Type – “Automatic”. 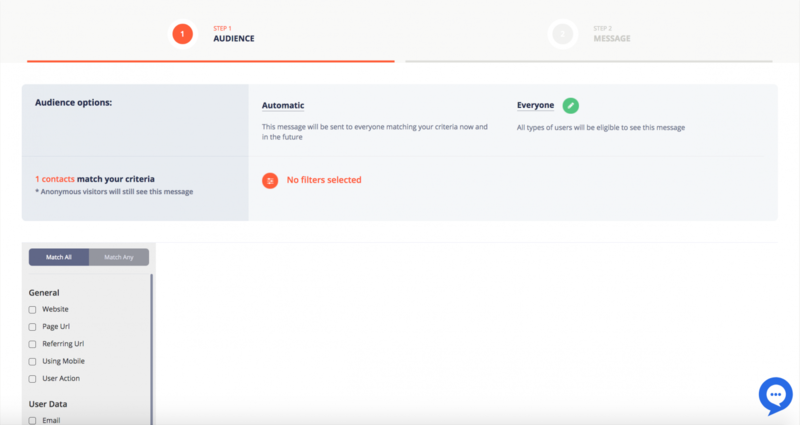 This means, your message will be sent to everyone matching your criteria now and in the future. i. Anonymous Visitors – unknown visitors who are not logged in to your website and haven’t had any conversation with you previously. ii. 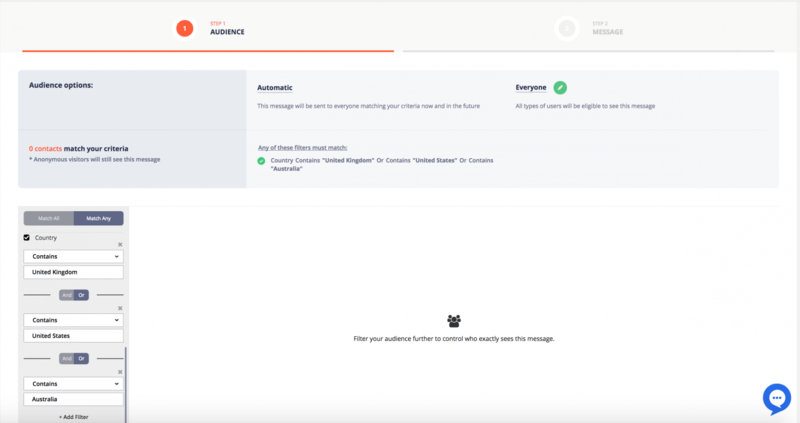 All Users and Leads – all contacts stored under your account that are classified as Users and Formilla Leads (basically all the contacts you see on the ‘Contacts’ screen in your Formilla account). iii. My Users – contacts that have logged-in to your website. When integrating your data into Formilla, these users will appear with an icon on the Contacts screen to distinguish them from Formilla Leads (below). iv. Formilla Leads – contacts that have had a conversation with you via online chat, offline submission when you’re unavailable from chat, or that have subscribed to an Edge Email widget. Note: under the Audience section you can see the number of contacts that match the criteria you have set. 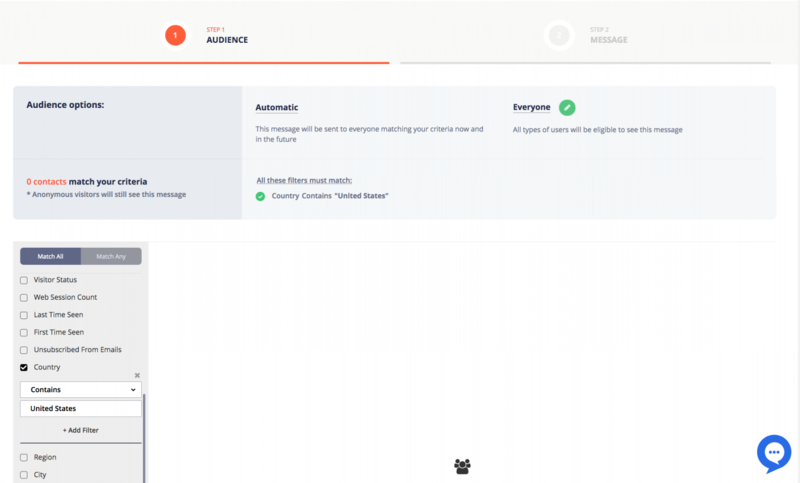 You can also use additional filters to narrow down on the exact type of visitor you want to show your Smart Message to. Visitors who have a particular browser language: (e.g. Spanish speaking customers) Hola, ¿hay algo en lo que pueda ayudarte? If you’re targeting a new visitor, create a chat smart message in which only new visitors to your website would see. Then, in the Audience tab, set the Target Audience to Everyone, scroll down to visitor status on the filters panel (left-hand side), click the box to enable it, and it should say “is new user” and save changes. If you’re targeting a visitor that has been to your website in the past, follow the steps above, but instead of “is new user” select, “is returning”. To set up a chat smart message so it only pops up for visitors on a specific page, then, in the Audience tab, set the Target Audience to Everyone, scroll down to Page URL on the filters panel (left-hand side), select “exactly matches”, followed by entering the specific page/s that you’d like that particular chat smart message to be displayed on. Note: when entering the Page URL kindly only put the URL of that particular page, such as “/shop.html” as shown in the image below. Do not use the full URL. Alternatively, you can use the condition: “Page URL: Contains:” This will allow for looser matching, such as “shop”. Example: Hi there! Did you have any questions about placing an order? To set up a chat smart message so it only pops up for people from a particular country, for example, in the Audience tab, set the Target Audience to Everyone, scroll down to Country on the filters panel (left-hand side) and list the country/ies that you’d like that particular chat smart message to be displayed to. To set up a chat smart message so it only pops up for people whose browser is set to a specific language, you’ll need to set the Target Audience to Everyone in the Audience Tab, scroll down to Browser Language on the filters panel (left-hand side) and list the language that you’d like that particular chat smart message to be displayed to. Use “Match Any” when you have selected multiple filters and want the chat smart message to show up for any of them selected (match any of these conditions). Use “Match All” when you would like the chat smart message to show up only when all of the conditions apply. Example: Show to only those who are returning visitors AND are located in the U.S. There you have it! 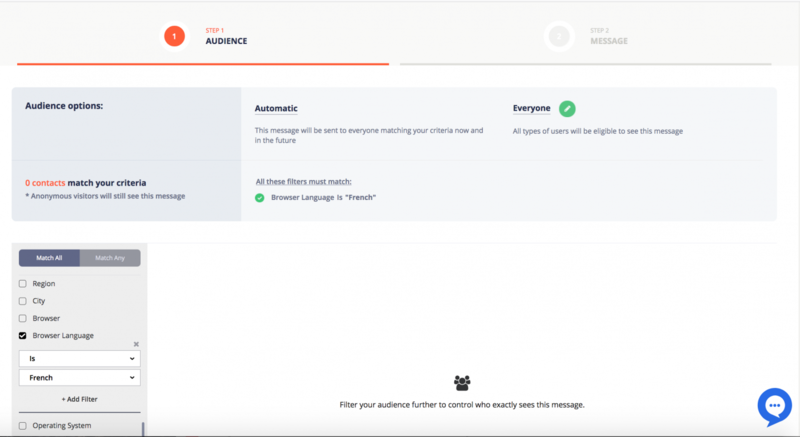 Adding chat smart messages allows for more advanced targeting of your visitors. If you’re having trouble, just CONTACT US! We’re always happy to help and we mean that! This is a really cool feature. i am going to have to sit down and set up a few of these on my website!